In the fall, my weekends are filled with football. We tailgate all season long until college football games are over – and our Sundays are filled with NFL games. We often invite friends over to watch games with us. I love hosting and being a good host means having lots of tasty food! I try to keep the food spread simple but also have quality options. I want to give my guests the impression that I tried a little – not just some chips and salsa, ya know what I mean? Well, this weekend I made something I was so proud of! I made what I am calling Greek Meatballs with tzatziki. 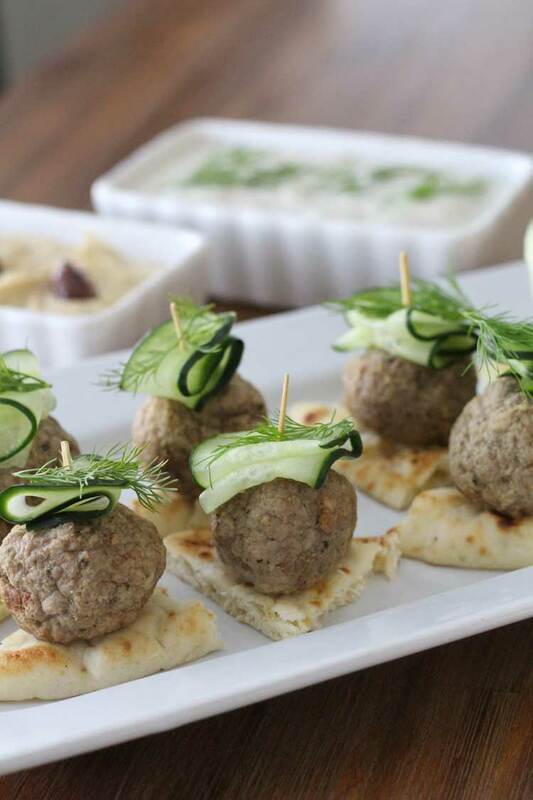 Greek Meatball Appetizers with Tzatziki Sauce only require a little effort. I was able to use all organic ingredients, thanks to the meatballs being organic chicken. 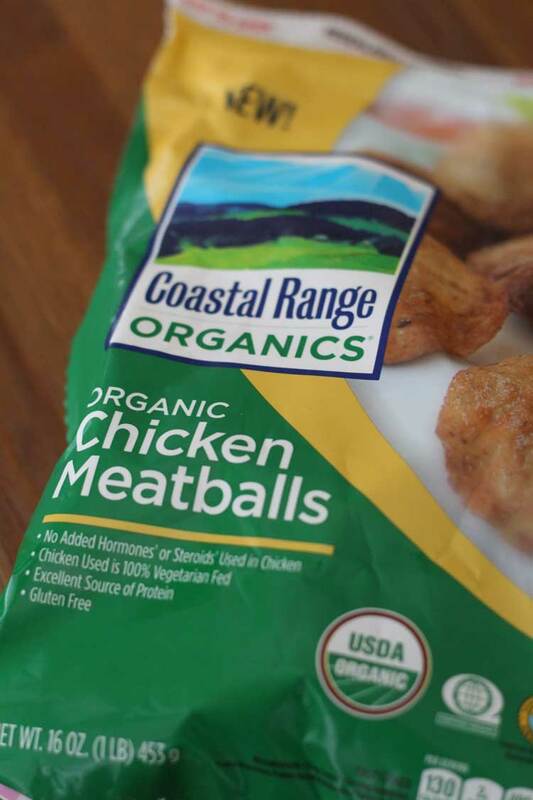 Cook the Coastal Range Organic Chicken Meatballs according to the directions. These can be done in the microwave or the oven. I prefer the oven, and then you can pan fry the edges if you’d like to get them to look a little darker and toasted. While the meatballs are cooking (only 12 minutes) cut up cucumbers with a vegetable peeler or use a mandoline slicer. I was able to get all about 10 slices from one cucumber! Make sure they are thin enough so that you can manipulate them into little folds. Take your fresh dill and break it into small bits to put on the top of the appetizer. Cut up the pita bread into triangles, just a little bigger than your meatball surface. Put it all together with a tooth pick to hold them in place! Ta-da! You guys, seriously this is so easy to make – it took 14 minutes and looks gourmet, don’t you think? All you need are a few ingredients – thank goodness for the already made meatballs! I don’t have time to make homemade meatballs when my football game is on! 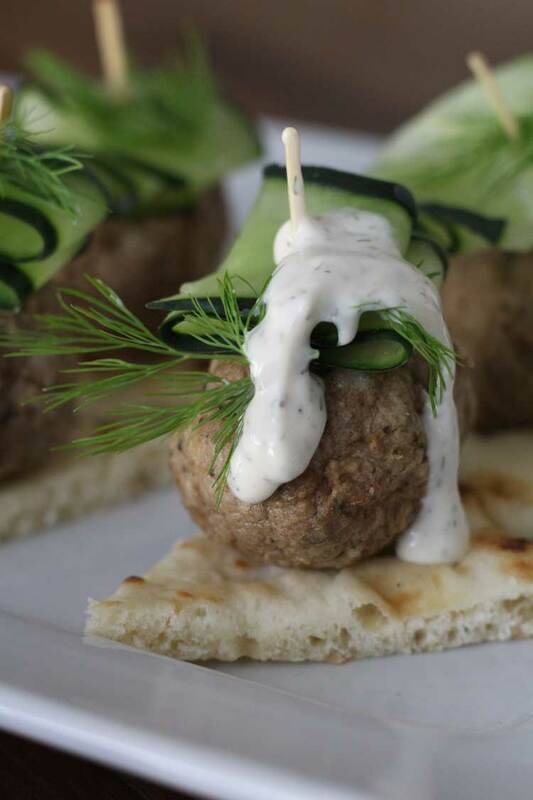 But if you want to add some awesome flavor, don’t skip out on the tzatziki sauce – that gives it the real Greek finish! Tzatziki sauce is pretty easy to make, and you can make it ahead of time. 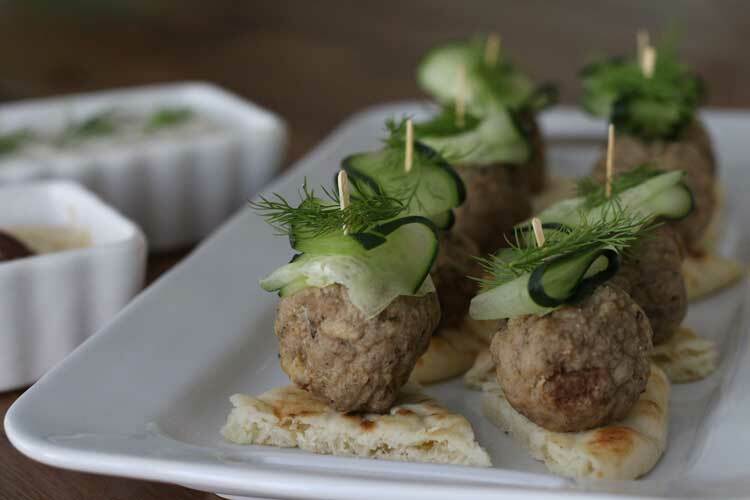 It can be drizzled on the meatballs, or if you want to maintain the presentation, put it on the side for dipping. The sauce was devoured in my house! We used the leftovers for carrots, celery sticks and pita chips! Thick tangy Greek yogurt combined with crisp and fresh cucumber and strong lemon and dill. 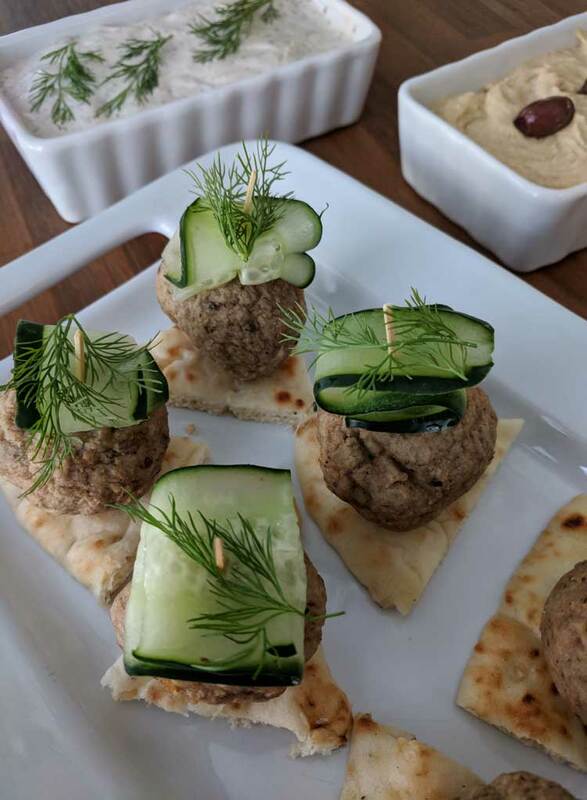 It is a full-flavored dip or sauce, perfect for these meatball bites! 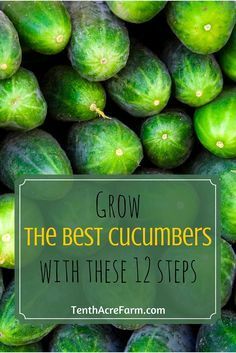 Dice up the cucumber (without seeds, without skin, without ends). This should be about 1 cup. Add to the Greek yogurt and mix. Next add the remaining ingredients - garlic, dill, lemon juice and salt. Mix thoroughly and taste. Cover and let the ingredients sit in the fridge for at least 30 minutes, but best an hour or more. The flavors will blend and strengthen. This is a recipe that is delicious for grilled lamb, chicken, gyro meat, dipping sauce for veggies or pita bread. It is versatile and tastes so much fresher than plain 'ol ranch! 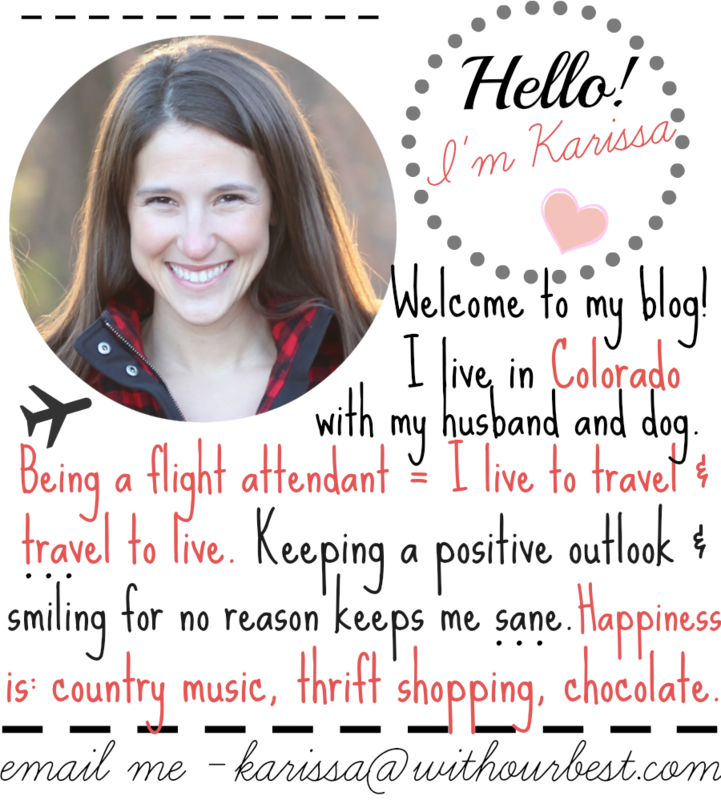 I am loving the Coastal Range Organics products. I found them at Safeway for $4.99 on sale! That’s an incredible deal for organic. I know that they aren’t homemade, but honestly with both my husband and I’s full time work schedule, having organic frozen chicken is a better option than ordering pizza or getting fast food every night. Which is what we would do! This way we are eating organic! 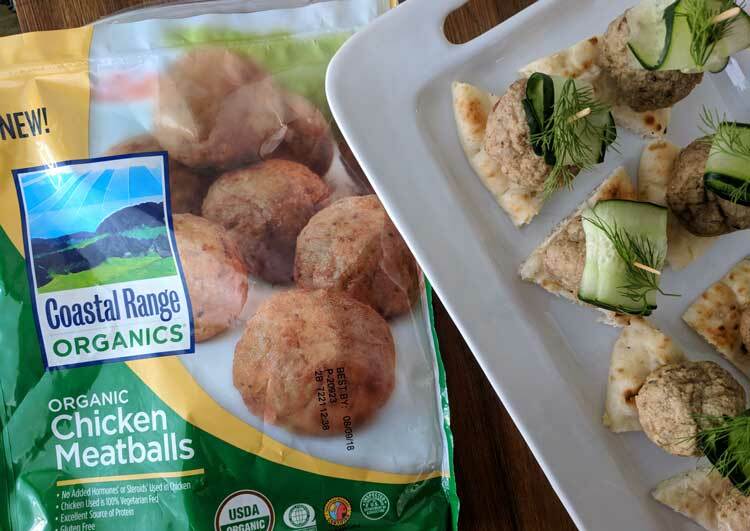 Putting an organic meal on the table – Coastal Range Organic Chicken with some organic frozen veggies – means we are able to eat a wholesome meal that takes little time and thought. Coastal Range isn’t any old frozen food either. Their chickens are never treated with antibiotics or growth-enhancing hormones or steroids. Coastal Range Organics chicken are also free-range and live on pesticide-free land with plenty of room to exercise and grow naturally. Because they’re raised on a fully organic diet with all natural, 100% vegetarian grain feed, they’re just naturally great-tasting. Where to buy Coastal Range Organics products? Currently only available in Northern California, and at Safeway and Albertson’s stores in the following areas: Seattle, Denver , Salt Lake City and throughout Idaho, Wyoming and Montana. Why do you want to try Coastal Range Organics? What do you like about the products? 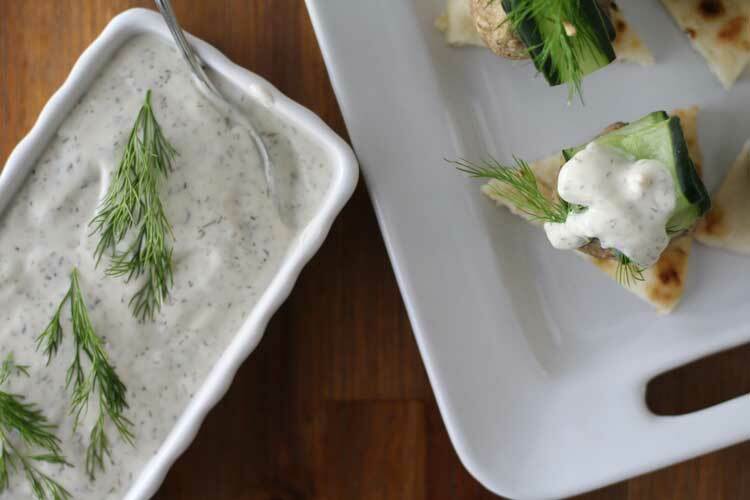 I absolutely love Tzatziki sauce! I had it for the first time a few years ago and have been addicted ever since! Your recipe looks like one I need to try out with my family. The sauce pairs perfectly with cucumber! Yum! This looks scrumptious! I am a huge fan of Greek food and Tzatziki is my weakness! Will give your recipe a try! Ooooh I love Greek cuisine. These meatballs look amazing. I love that you served it with tasty dips. Hummus and babaghanoush are my faves!! What an easy appetizer! And sounds like a great combination. The sauce and the dill really add a fresh component to the dish. I’ll have to give this a try sometime soon for our holiday parties! 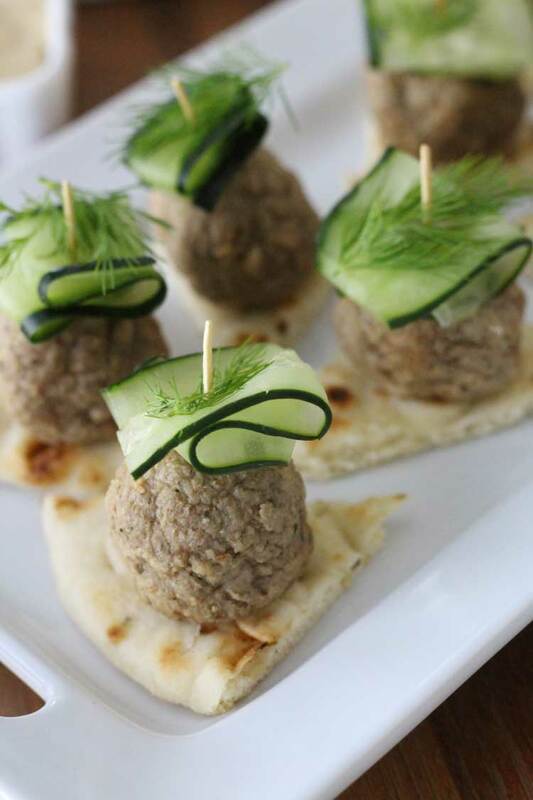 These would make a delicious and interesting appetizer for the holidays! I’m such a tzatziki fan. Anything with tzatziki is a win! My daughter is a real fan of meatballs. And I love me some good Tzatziki sauce. Between the two it’s like a match made in heaven. I will have to try these out. 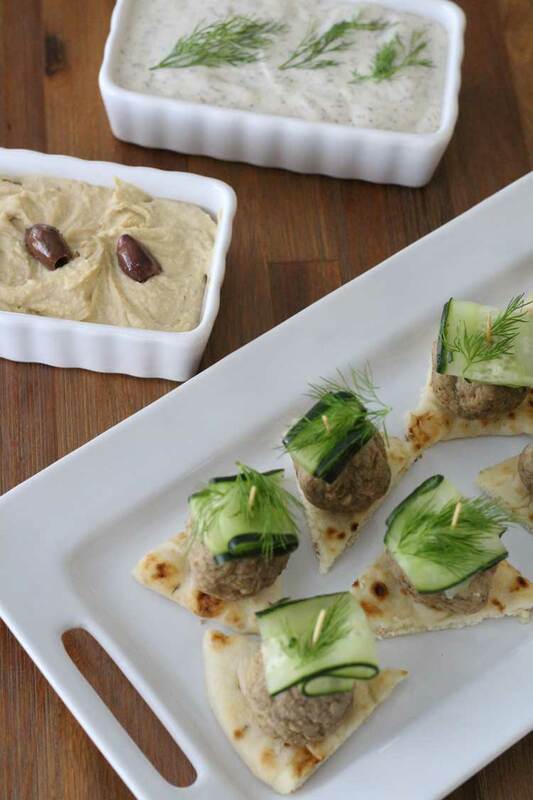 I am wanting to make an appetizers with Tzatziki sauce. I cant wait to make this for my next dinner party. Definitely bookmarking this post. 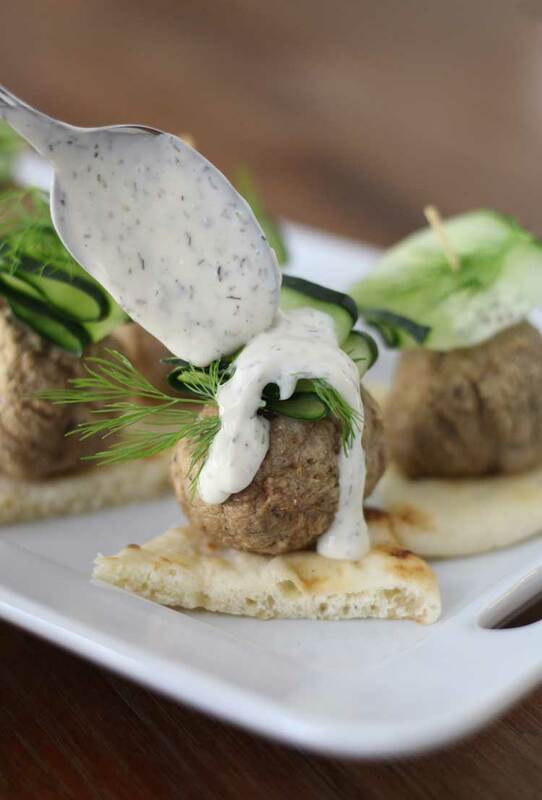 I love meatballs…and I REALLY LOVE Tzatziki sauce – Iget extra at every Greek restaurant I visit. what a great mix. Yum! I love meatballs and the appetizer looks so tasty! I’ll definitely bookmark this post and give your recipe a try. I am absolutely drooling over this recipe. I have never had Greek before, but this really makes me want to try it!